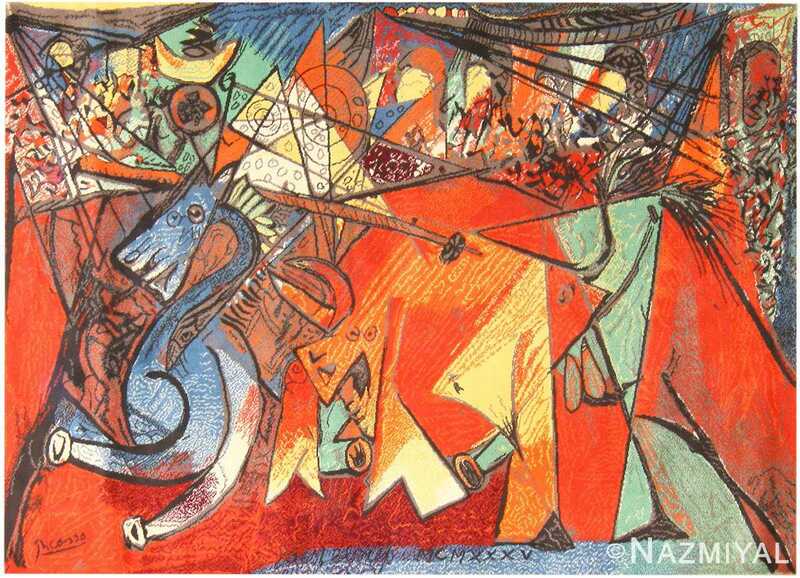 Picasso Rugs – Pablo Picasso The abstract figures and cubist works of Spanish artist Pablo Picasso (1881 -1973) are among the most recognizable and well known works in 20th century art. Born in the Andalusian region of Spain, Picasso was the son of an art professor. However, stories suggest his father felt Picasso surpassed his artistic abilities at age 13. 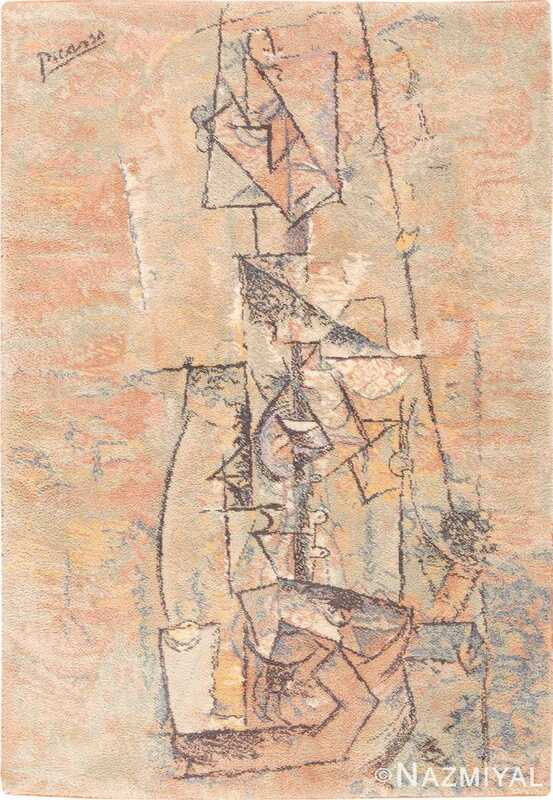 Picasso is best-known for the abstract cubist style he helped to develop during his career in France. 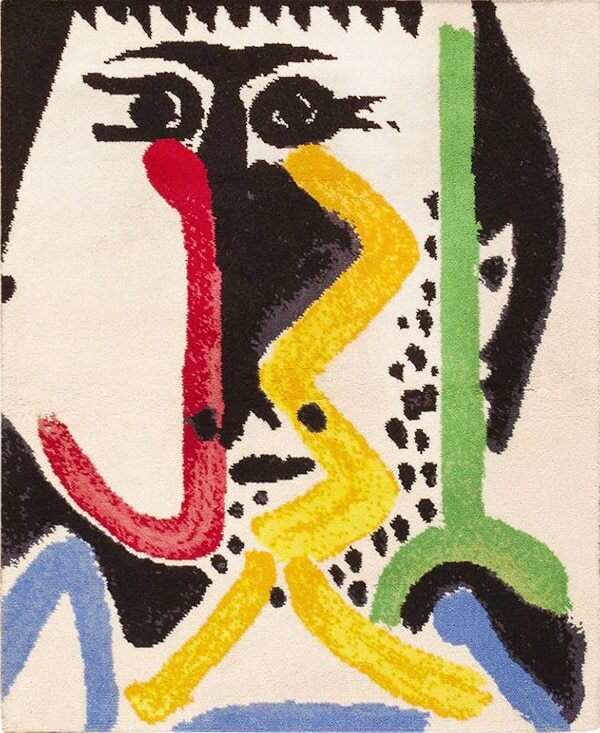 Although he did not create designs specifically for carpets, 15 unique works produced in his Montrouge studio were reproduced by the gallery owner and patron Marie Cuttoli. 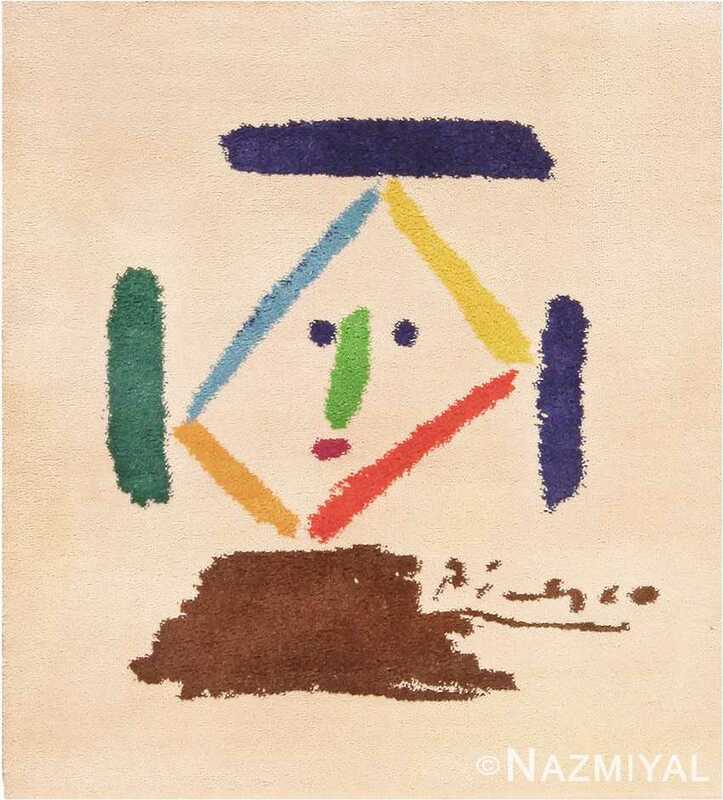 Picasso may be famous for his abstract drawings and paintings. But, few know the Spaniard has also left his mark on textiles. 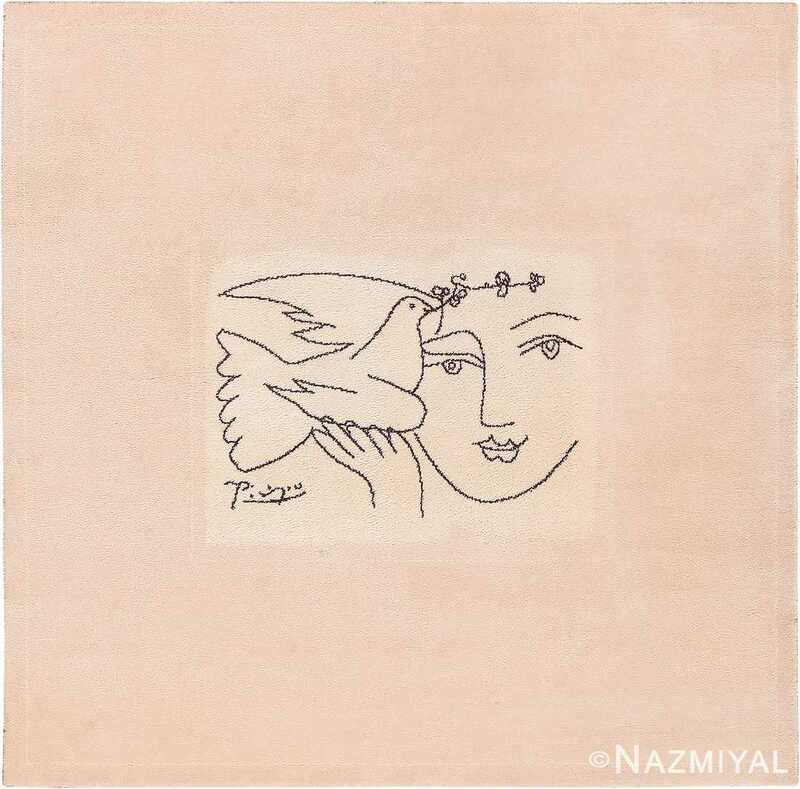 A handful of Picasso’s pieces have been replicated as rugs, and three of them are currently available from Nazmiyal. 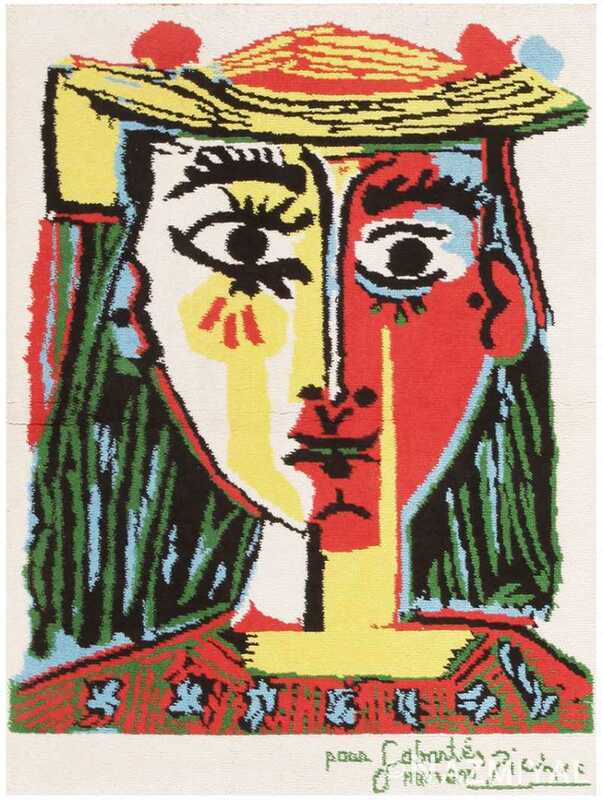 Among the Picasso collection is “Femme au Chapeau a Pompons et au Corsage.” Based on the 1962 linocut print of Picasso’s wife Jacqueline, it is a striking limited edition of unusual size and quality. “No other version of that piece has been found yet, which makes it is truly a rare find,” says Nazmiyal Collection’s Jason Nazmiyal. 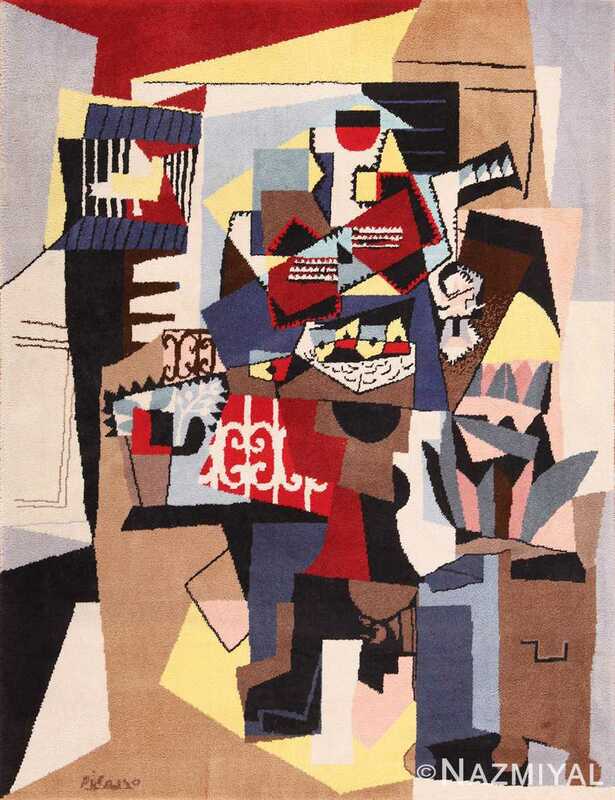 A second Picasso rug, “Tete d’ Homme,” is a striking interpretation of the abstract. 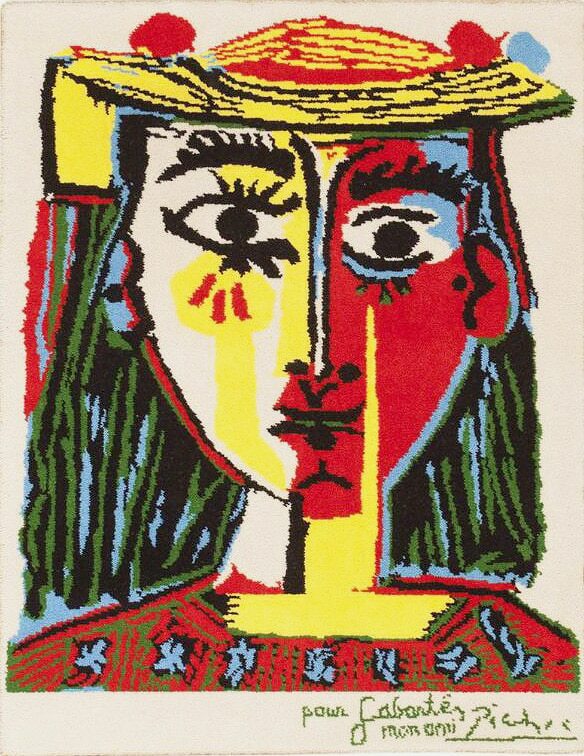 Bright colors juxtapose the bold strokes of a typically Picasso cubist face. 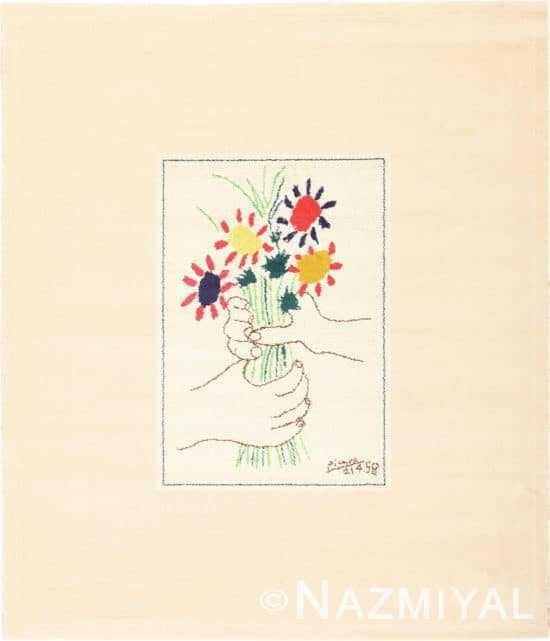 These two rugs were produced after the Pablo Picasso’s death in 1973, with permission of his heirs. 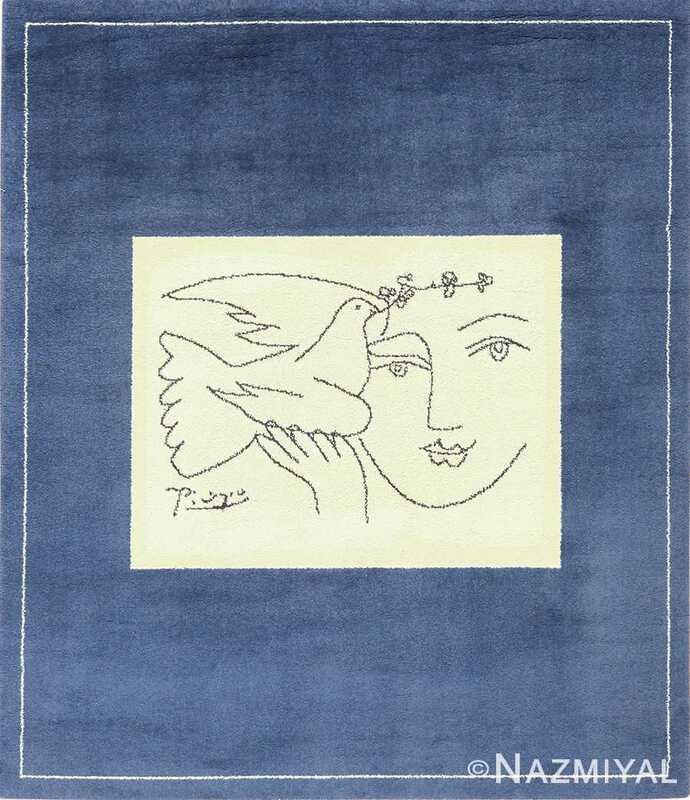 They are among a handful of other Picasso rugs, produced in his Montrouge studio by the gallery owner and patron Marie Cuttoli. 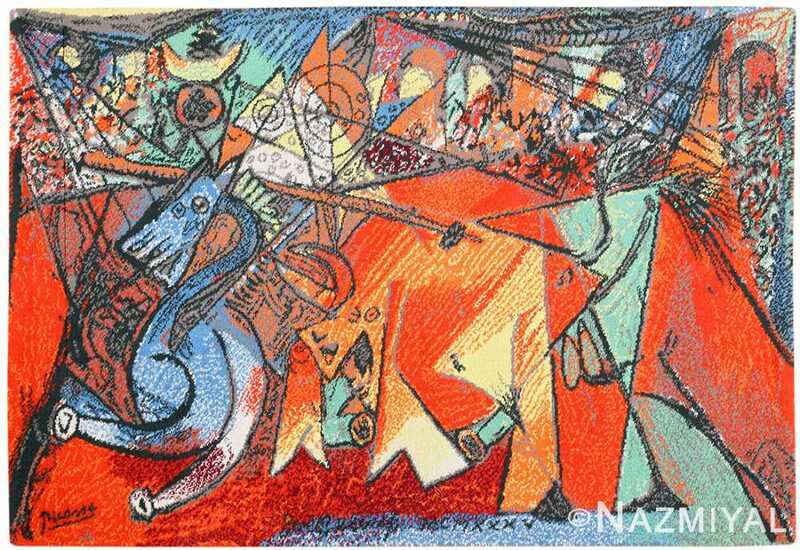 With these rare textiles, Nazmiyal adds to its selection of artist rugs, which already includes pieces by Kandinsky, Pucci, Agam, Panton, Corneille and others. They also add to the growing interest in textile art, which is often overlooked by art collectors – and less expensive. 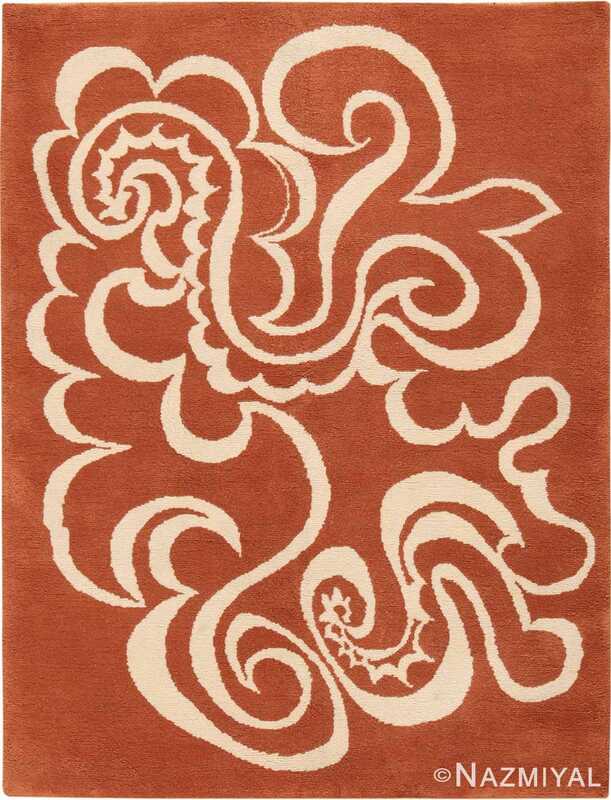 This exemplary Ege carpet features a stunning composition designed by the great Pablo Picasso. Vibrant shades of red and an abstract composition fill it with dynamism and energy. This remarkable carpet beautifully showcases Picasso's immediately recognizable style, boasting a cubist design of the highest order.